The Contacts collection is a database of your contacts. It’s also the first screen you see when you log into your account. Once at the Contacts collection, you can view, sort, and take action on your contacts, create new contacts, and manage groups of contacts. 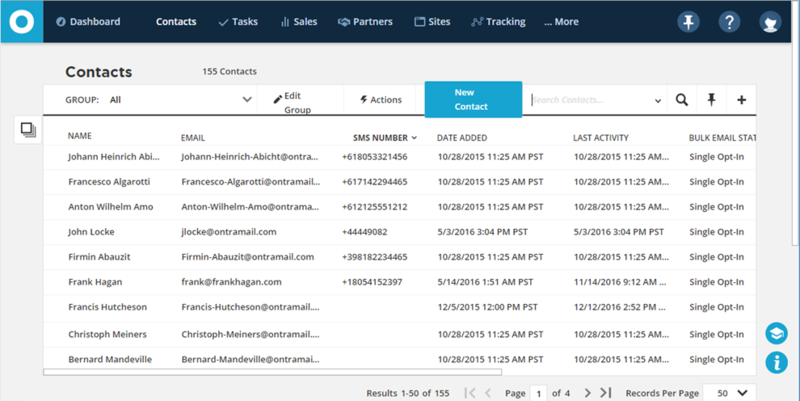 The Contacts collection is where you will do most of your contact management activities. Where is the Contacts Collection? To get to the contacts collection, click on Contacts in the navigation bar. Customize the fields that are displayed by clicking the + Add Column button in the upper right-hand corner. Sort your Contacts by clicking on the column headings. Click the heading again to reverse the sort order. 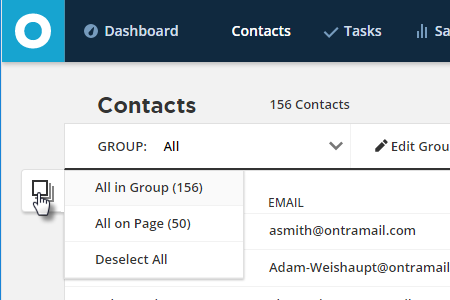 Change the number of contacts that display on a page at the bottom of the page. This setting will remain in place until changed again. Also note the status bar indicates the page that you are currently viewing. Search looks at the columns displayed to find the values you enter. To search for multiple search terms separate them by a comma. Entering "Paris, London" in the search bar when the City field is one of the column headings will show all Contacts with either Paris or London in the City field. Click the Group dropdown list to create a new Group, or load an manage any existing Groups. To search for a value in your contact’s database that is displayed in one of the column headings click in the search bar, enter your query, and press the Enter key. When you click on a contact’s name, you’ll see their contact details. This is where all the personal & up to date information you have for this contact is stored, as well as all their marketing information such as the Campaigns and Tags that are attached to them. The contact details area comes with certain default sections and fields in it. You’re also able to add additional fields and sections to store customized company, contact, or business info beyond the fields provided by default. These fields are populated automatically when a person fills out a form with corresponding fields in it, but you can also come in and populate any of the fields manually as well. Open the Contact Record by clicking on the name in the first column. You can edit the data in almost every field in the contact record simply by clicking on the field name or the data in the field. After you’ve made all the changes that you’d like to make, click the Save button to the right of the field and your data will be stored. To delete a contact record, navigate to your Contact collection. Place a checkmark in the box next to the contact record and select delete from the group action bar. This has a record of every change made to the Contact Record by the system or by one of your logged in users. Search this section to see when a Campaign was added, when a field was updated or manually added by a member of your team, etc. Any action affecting the Contact Record not done by the Contact is recorded here. This has a record of each interaction that the contact has taken including visits to landing pages or tracked web pages on your website, forms they’ve filled out, postcards, SMS and emails you’ve sent to them, and emails you’ve received from them if IMAP settings are enabled. You can click the individual logged items to see more details on each one, including the number of times, and when a given email was opened and clicked. 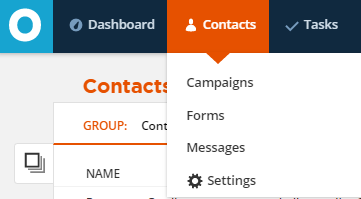 You can also add columns to the Contact Log list view such as Campaign, Legacy Sequence or Message details to see where a particular interaction came from. This section is used for jotting down information on the fly that doesn’t fit in any given field. If you have a form on your website on which you’re using the notes field for people to fill out, this is where the data will show up. Also, the notes you take down from phone calls logged, and from tasks will go here. This is where any tasks for a contact can be found. Once you’ve finished with a task, you can click the green check mark to mark it complete, and it will disappear if you’ve got the Hide Completed tasks box checked. You can also manage tasks for all your contacts on the same screen in the tasks collection. This section is where any purchases you log for a contact shows up. This section displays your contact's partner information including which partner program they're a member of, who referred them, and the sales they've accrued. The fields in this section can be edited. This is where you can add/view the Wordpress membership status of your contacts as well as edit their membership status and credentials. Select individual Contacts by hovering over the first column and checking the selection box. To select All in Group or All on Page, hover over the Multi Select Icon and select All In Group, All on Page, or Deselect All. Once you've selected either an individual contact, a page of contacts, or an entire group of contacts, the top navigation bar will reveal the actions you can perform. Email: Send a stored or new email to the selected contacts. SMS: Send a new or stored SMS message to the selected contacts. Task (Pro level or higher): Create a Task using the selected contacts. Tags: Add Tags to or remove Tags from the selected contacts. Campaigns: Add the selected contacts to one or more campaigns, or remove the selected contacts from one or more campaigns. Sequences (Pro level of higher): Add the selected contacts to one or more sequences, or remove the selected contacts from one or more sequences. Postcard: Send a Postcard to the selected contacts (US addresses only). Double Opt-In: Send the selected contacts the default double opt in email. Change Field: Change the value of a Contact Record field for the selected contacts. Export: Export the selected contacts (a CSV file is created you can download to your computer). Delete: Permanently delete the selected contacts. Q. Where can I get more information and ask specific questions about managing contacts? A. The ONTRAPORT Community Q&A Forum provides answers from our Certified Consultants and other members of our user community. Q. Can I create a Group of random contacts for split testing? A. Yes, you can use the Contact ID field and set the criteria that the Contact ID ends with "0" to create a Group representing about 10% of your total Contacts. Adding additional numbers using OR will increase the size of the group. Q. I noticed the export file is saved in Contacts > Settings > Exported Lists. How long are they kept? A. ONTRAPORT will keep your export file for 60 days, and then discard it. Can you export contact information to excel? Set each column with long phone numbers in international format, zip codes, etc., to "Text"
ONTRAPORT keeps your export file in Contacts > Settings > Exported Lists for 60 days, and then discards them. Remember to archive the list on your local computer if you want to save it longer than that.